For Those Wanting Information on Camps! 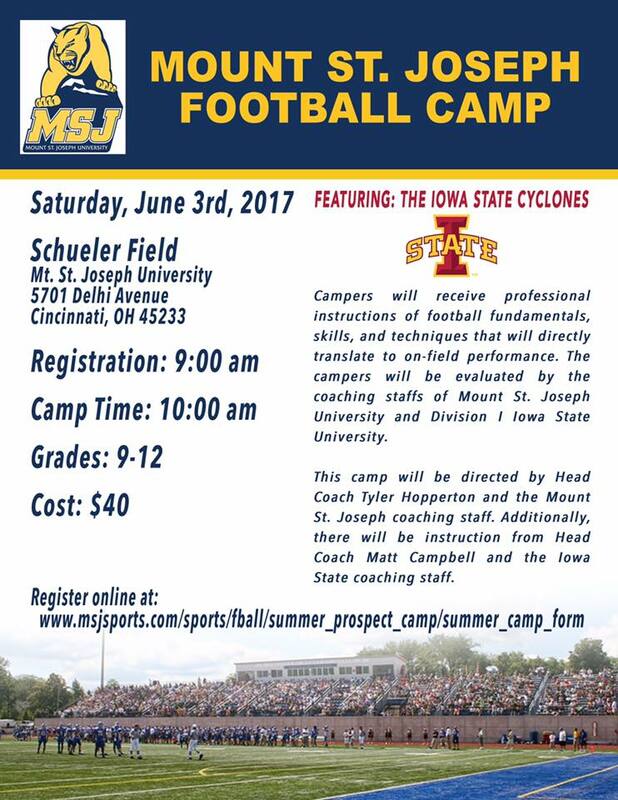 Mount St. Joseph’s in Cincinnati, Ohio is having a Camp at which time the kids will be instructed by the combined football coaching staffs of Mount St. Joseph’s and the Iowa State University Cyclones. Applicants must be in the 2018-2020 graduating classes and must have Hudl Film and qualifying scores in his course work and, where applicable, on the standardized admissions test (ACT or SAT). This is an exciting opportunity to get excellent football instruction and to get seen by two fine college coaching staffs working with your player in a close setting which has the opportunity for that player to leave a lasting impression. The information is being provided here at Kentucky Prep Gridiron in connection with our friend, Coach Ricco Hughes, Executive Director of Kentucky Future Stars Football, so Future Star Alums, take heed and take advantage. Next Post:For What Should Parents Look in Picking a Football Camp?